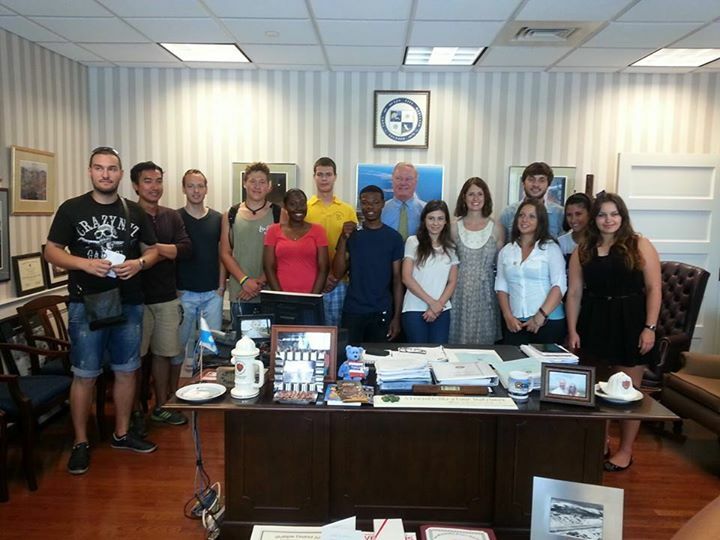 On July 15, 2014, as part of the Ocean City Seasonal Workforce Committee program, several J-1 students had the opportunity to learn about local American government by visiting City Hall for an up close and personal meeting and luncheon with the Mayor, and then experiencing an actual council work session. Prior to the city council work session, the group had the opportunity to sit down in Mayor Rick Meehan's personal office for a discussion with special guest Deputy Assistant Secretary of State Robin Lerner, who oversees the Department of State's J-1 Visa Exchange Visitor Program. As a part of the open discussion with about 15 students from around the world, Mayor Meehan expressed how he feels that the J-1 students make a positive difference for the town, filling summer positions that are vital to a resort area. He thanked them for choosing Ocean City for their Work and Travel program. The students participated openly in the discussion by introducing themselves and telling where they were from. They asked questions about how the local government works and commented on how safe they feel in Ocean City. Mayor Meehan said that he was proud that Ocean City is a clean, safe place for people to visit and to live and is especially pleased that the international students choose to come here as a part of their cultural exchange programs. Following the meeting in the Mayor's office, the students enjoyed a boxed lunch together and then sat in on an actual city council work session, where they experienced first-hand, how local government works in Ocean City, Maryland.